Ramblings from an Over-Squozen Brain: We're HOME! It's good to be home! It's good to be home! I will post some more about our trip later, and upload some more pics, but I have to tell you about a surprise some wonderful people at our church gave me. Perhaps you have heard of the Extreme Makeover series on TV? The show highlights changes made by people who undergo plastic surgery, exercise regimens, hairdressing and wardrobe consultations before being presented back to their adoring friends and families. There have been several spinoffs, including a Wedding Edition and the most popular, Extreme Makeover: Home Edition. 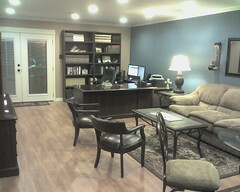 Well my church family did them one better with Extreme Makeover: Office Edition! Lori and I came up to the church this morning to lend a hand to the AngelFood distribution day. After the initial rush was over Bud Frederick told me he needed to talk to me and started walking me outside. Little did I know that he was setting me up! He walked me to the side of the building where a big truck was parked, blocking my view of the office wing. As we talked, Lane Fletcher started the truck up and pulled it away. Bud directed my attention to the office wing and I saw that new doors had been installed where we had planned to move my office! I also saw beautiful steps had been installed! But that was only the beginning! I don't know how to say "thank you". This is such an overwhelming thing, such an incredible expression of love. I'm used to being on the giving end of this kind of thing, not on the receiving end. It is humbling and exhilarating all at the same time! I serve with an AWESOME group of people and it's a privilege to serve with them. Thank you - every one of you who participated in making this blessing a reality! My mom and dad, Betty & Buddy Martin - I've been told by several that my mom was the force behind this. And dad supported it all the way. Thank you guys, so much! Bud & Donna Frederick - As I look through the pictures I see Bud and/or Donna in most of them. You guys are incredible! Fred Mennerick & Lane Fletcher - These fellows put the "grunt" in "grunt work!" There's NOTHING these two can't do! Jenni Baier and David McBride - Computer techs extraordinaire! I'm blown away by the machine you built for me. I have to fasten my seatbelt just to turn it on! Kyle Frederick - the floor is beautiful! It gives the room such an elegant, finished look. You da man! Warren Spurgeon - the entry steps are gorgeous! What a great touch, matching the stones on the front of the building! I LOVE serving Jesus with YOU!